There was a unicorn on the cover. That was the first thing I noticed. Also a cute boy riding the unicorn, but, well, to fifteen-year-old me, that was actually kind of secondary. Fifteen-year-old me had a thing for unicorns. 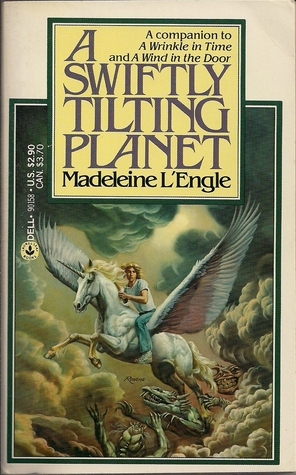 A friend had pressed the book, Madeleine L'Engle's A Swiftly Tilting Planet, into my hands. I was familiar with L'Engle's name, because back when I was eleven, I'd gone looking for A Wrinkle in Time in our school library, failed to find it, and read A Wind in the Door instead. At eleven, I'd found A Wind in the Door kind of weird, for reasons I no longer recall, so I didn't read anything more of L'Engle's. Yet the friend who'd given me A Swiftly Tilting Planet talked so enthusiastically about a character named Charles Wallace--that would be the boy riding the unicorn--that I began to wonder whether maybe, somehow, I'd missed something. I gave A Swiftly Tilting Planet a try. Not with the unicorn, though I adored the unicorn, whose name was Gaudior. I liked Charles Wallace well enough, too, and liked his older sister, Meg Murray, more. But what I fell in love with was the light. Madeleine L'Engle's books have always been, for me, about the play of light and dark. Her universe is deeply infused with both, and while the darkness causes real losses and real pain, the light is just as real, and it can prevail, too. In her books, it does prevail. In A Swiftly Tilting Planet, prevailing meant avoiding a nuclear war that, even in the 1980s, still seemed pretty possible to many of us. The idea that maybe such a war didn't actually have to happen -- that awful things in general didn't have to happen -- was pretty comforting to my teen self. I read that book over and over again. I bought a copy of my own, and wore it out; bought a second, which these days is also showing serious wear; and when I bought a third, as part of a boxed set, saw the unicorn was no longer at the center of it, I resolved to keep both my second and third copies. After I read A Swiftly Tilting Planet, I bought my own copy of A Wrinkle in Time, too, a book in which, among other things, we meet a star who very literally sacrifices her light to fight the dark. That's also the book where I met a younger Meg Murray, and saw my own self mirrored in Meg's glasses and anger and tangled brown hair; and where I found a different sort of comfort in the idea that there just might be a Calvin O'Keefe who loved all my rough edges out there in the world, too. That notion wasn't only about the romance; it was about the idea that the world in general might hold other people like me. How could L'Engle have written a character like Meg Murray, if it didn't? I can't say for sure that L'Engle's books changed my life. Maybe I would have found what light and comfort I needed elsewhere if I hadn't found it there. What I can say for sure is, her books made my life better. After A Wrinkle in Time and A Wind in the Door (which I liked better the second time around), I read L'Engle's The Arm of the Starfish, in which the tensions between light and dark turn more human. I struggled with the book's conviction that everyone was a sparrow whose fall we needed to care about, that caring about bright and shining things doesn't mean you simply get to dismiss those who disagree with you--even who hurt you--as part of the dark. The seeds of those social justice threads took longer to take root in me, perhaps, but they're a part of how I see the world now, too. The Arm of the Starfish was also the first book in which I remember mourning the death of a fictional character, because it turned out I'd finally let myself fall in love with one of the cute boys I was reading about after all. As an adult I still regularly reread all these books, and when I do, I see imperfections I didn't notice as a teen. The moral messages can get pretty heavy handed, for one thing; the gender politics, while better than many books written in their era, are still problematic; and A Swiftly Tilting Planet in particular links genetics to good and evil in a way that's very troubling indeed. I don't know how I would have reacted L'Engle's young adult books, had I first read them as an adult. But I didn't first read them as an adult. I first read them as a teen looking for ways to believe that there was something in the world, beyond all its messed-up-ed-ness -- a messed-up-ed-ness I was just beginning to understand -- that was fundamentally all right. I still believe in that something. I still believe that in the end there's always light shining through the dark, after all. Janni Lee Simner has written YA and middle grade fiction, including Bones of Faerie and Thief Eyes. Her short fiction has appeared many places, including in the recent Welcome to Bordertown anthology. You can find her on the web here, or on twitter as @innaj.